If your gums rest too low or too high on your teeth and you are unhappy with your smile, you may be a candidate for gum contouring surgery. Also called gum reshaping or tissue sculpting, this cosmetic dental procedure can even out an uneven gum line and give you a smile you can be proud of. Gums that are too high and make your teeth appear long are often caused by gum recession, a condition in which gum tissue pulls back from a tooth and exposes the tooth's root. Not only can gum recession make your teeth look long, it can lead to serious dental problems such as decay and tooth loss. 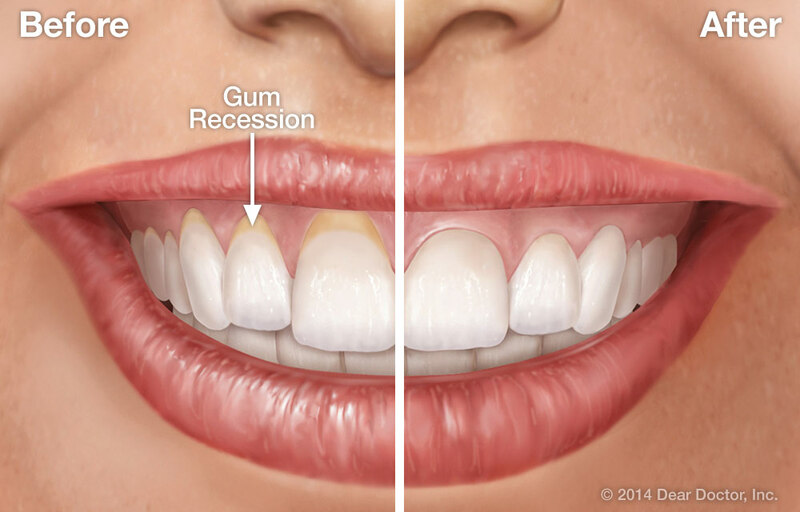 Gum recession may also be a sign of periodontal disease, the deterioration of the supporting structures of the teeth (gums and bone). Gum contouring surgery is performed in the dentist's office. Currently, dentists use scalpels, lasers, and radio-surgery to perform the gum contouring procedure. Ask your dentist which technique would be the most suitable for your situation. Ease pain by taking an over-the-counter pain reliever, such as Tylenol or Advil, as directed by your dentist. Do not take aspirin, which can cause bleeding. Eat soft, cool foods, such as eggs, pasta, yogurt, cottage cheese, soft vegetables, and ice cream, for the first few days after surgery. Avoid spicy foods and anything with seeds until your gums have healed completely. Follow your dentist's directions on when and how to brush your teeth during the healing process.